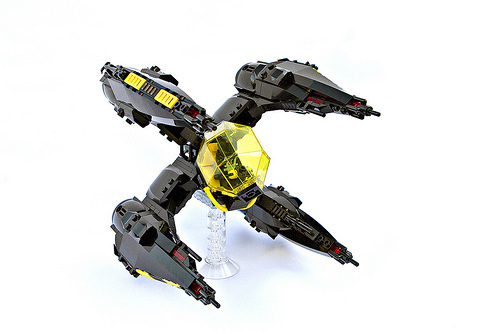 This new ship by Stuart (OptimalControl) brings Neo Blacktron to a cool new level. The unconventional shape really makes an impact. I also like that there is so much black against black surface detail, it really makes the few spots of color pop out, especially the cockpit. Speaking of the cockpit, it’s fantastic, it’s set at an angle we don’t see often, one that I’m sure took a lot of effort to achieve. The design reminds me, a lot, of the Babylon 5 starfuries. A striking design with plenty of actual physics and scientific bases.